Shrimp and garlic with a little bit of spice and the refreshing crunch of fresh asparagus make this the perfect pairing for our summery Pinot Gris. This is one of our favorite outdoor meals, to be eaten at sunset beneath the maple trees in our front yard. Serve with pasta for a hungry crowd or without for a lighter summer picnic. Combine olive oil, cheese, garlic, brown sugar, soy sauce, and red pepper flakes in a large bowl. 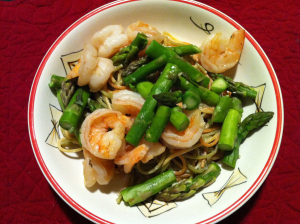 Add shrimp and asparagus, and marinate for at least 30 minutes, stirring occasionally. Cook mixture in a large skillet over medium-high heat for 3 minutes. Garnish with green onions and serve immediately over pasta or alone, with Stone Cottage Cellars Pinot Gris.